Homemade Easy Pasta in Quick Tomato Sauce is Continental food recipes. It is very tasty and yummy dish and very easy to make. Here are some simple method to make it with less time. To prepare this homemade easy pasta in quick tomato sauce, microwave covered 6 cups water, 1 tbsp oil and 1 tbsp salt for 10 minutes. Stir once in between. Let it stand in hot water for 2-3 minutes till soft. Sprinkle 1 tbsp olive oil on the pasta. Microwave 2 tbsp oil, crushed garlic, capsicum, ready-made tomato puree,pepper, oregano and salt for 6 minutes. Add boiled pasta, mix well. Keep aside still serving time. To serve, add tomato, cream or milk and water to the pasta. 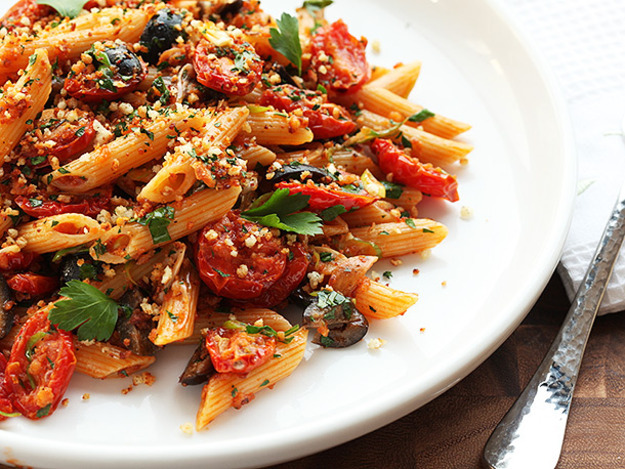 To prepare this homemade easy pasta in quick tomato sauce, boil pasta in 3 cup water, 1 tbsp oil and 1 tbsp salt. Boiled it until pasta became soft. Strain. Sprinkle 1 tbsp oil on the pasta. Now, take a pan add oil and onion. Now add capsicum, ready-made tomato puree, pepper, oregano and salt. Now add boiled pasta, mix well. Add tomato. Cook for 2 minutes. Serve hot or with garlic bread. You can also add vegetables like broccoli, baby corns or mushrooms along with capsicum.